The British Show Horse Association (BSHA) is offering complimentary membership to competitors that are only competing in Horse of the Year Show (HOYS) Ridden Hunter Qualifiers. Competitors will be given “Honorary Associate Membership” from May to October 2014, enabling them to compete in all HOYS Ridden Hunter Qualifiers for 2014. Associate membership does not confer any voting rights, so any competitors wishing to partake in the AGM later on this year must ensure they take out BSHA Full Membership. 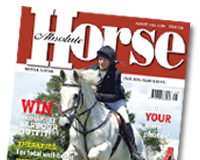 This will assist those Hunter competitors who had paid their 2014 subscriptions to Sport Horse Breeding of Great Britain before the rule changes regarding HOYS qualifiers were announced. All horses competing in HOYS Ridden Hunter Qualifiers must be registered on the BSHA HOYS Ridden Hunter Qualifier Register for 2014. There will be a fee of £50 per horse, in line with registrations for Hacks, Cobs, Maxi Cobs and Riding Horses. Registration forms for Hunter competitors, including horse registration, will be available to download from the BSHA website. The BSHA website is being updated to allow hunters to be registered online, but until that system is ready, all hunter membership and registration applications should be sent to the BSHA office. All Cuddy Working Hunter of the Year qualifiers will be marked out of a total of 100, as in previous years. The “Go Round” will not be marked. All shows running the class have been sent copies of the HOYS mark sheets for this class.